Steam 'Early Access' users will receive this update Thursday August 17th. Xbox 'Play Anywhere' players can also expect this patch to hit their consoles or Windows 10 machines August 17th. 1. Fixed audio settings to not always default to zero. 3. Fixed an issue that would cause some savegames to cause the game to crash on load. 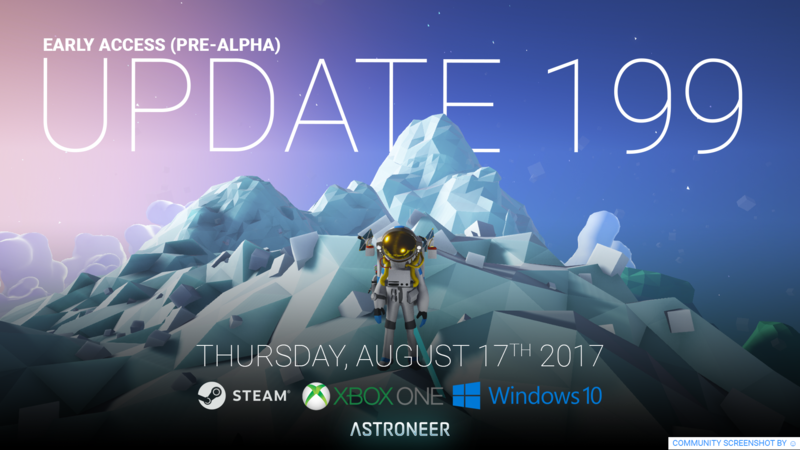 Update 199 is the first update with the full added force of our new but extremely well rounded Engineering team. While the designers were busy pushing out our first experimental tests for new content, as well as making HUGE leaps forward on Modularity, Research 2.0, & Terrain 2.0 (more on that later) the engineers worked to bring Astroneer to a MUCH more stable state. These notes will contain a somewhat abbreviated list of these extensive fixes, but I want to take a second and sincerely thank everyone who took time to pack up crash reports and saves to send over to the team. They were a huge help and benefit the larger community in extremely meaningful ways. The team was able to close out dozens of bugs in the main branch of the game, as well as numerous ones discovered during our Experimental Tests. Every tweet, email, message, & post means a lot. Thank you. You can find these updates in 0.3.10199.0, the current build of the game. [AS-896] - The Options Menu has been completely overhauled. Adjust graphics options to suit your hardware, including Shadow Quality, AA, PP and effects. Audio options now actually work! Adjust them to your liking. Keybindings on PC will now remain saved between sessions, with some added options like mouse sensitivity, toggling the hold to sprint, and others. Right now navigating and adjusting options in this menu is a little wonky, as you have to use the keyboard. Didn't want to hold it out of this update just for that reason. This menu will continue to be updated over the course of the next few releases. Known issue: 8/17/17 - When the game is in fullscreen, changing resolution has no effect. We are working on a fix! The maximum return value is always the number of slots on the trade platform rocket. Now, once you reach the maximum return value, you will not be able to add more resources to any remaining open slots. If you add an item that pushes the trade value above the maximum, or switch the return item to something with a more favorable exchange rate, the actual return will always be clamped to the maximum. Resources that are on the trading platform already when the maximum return value is hit or exceeded can always be removed (but cannot be attached again unless removing them causes the return value to dip below the maximum). [AS-1305] - Beacon colors can now be changed. This longtime request has now been implemented. Beacons now serve as aids for finding a previous spot, as well as for navigation. Use the in-game UI to cycle through colors or choose the 'red strobe" option for emergencies. [AS-1145] - Audio has been migrated to the Wwise Engine from Unreal 4 and remixed using the new technology. 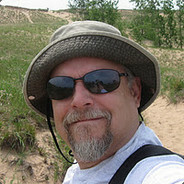 New cave exploration music tracks added. Remixed / mastered existing music with additional instruments added. Tracks broken down into separate layers to leverage Wwise game states. Music becomes distorted when low on oxygen. Music changes based on time of day. Sound is sent through a reverb when underground. Footstep sfx are affected by the movement speed of the player. Ambience loops no longer heard when at the main menu or orbiting a planet. Both the medium and small generator’s audio slows down when their “fuel” is near empty. When death occurs, sounds stop playing earlier. Music does not abruptly start again when death occurs, it now fades back in over an extended period of time. Wind turbine audio more appropriately matches their animation frequency. Sandstorms now have improved distance attenuation and better stereo / surround panning. Sandstorm rock impact added for when the player gets hit by a boulder. Low oxygen breathing audio now triggered more abruptly rather than a gradual fade in. Rover tire audio no longer plays when vehicle is in the air. Rover engine audio revs when vehicle is being powered and leaves the ground. Improvements to the active voice count in the game, allowing for slight performance gains. [AS-1259] - Each suit now has a unique Death animation. As shown off in Vlog 11, some of Gene's new death animations are now in! ?? In addition to numerous under-the-hood fixes which will improve your play experience, the following live issues have been fixed. Thank you to everyone in the community who has reported and shared details with us on these issues. Fixed several issues causing Multiplayer crashes which occurred when Client players returned to their base after venturing far away from it. Fixed a number of performance degradation issues relating to base conduits. [AS-691] - Biome Ambience SFX will no longer play when the player is in space. [AS-915] - In Multiplayer games, the sound effect of building loops no longer continues playing for the Client player. [AS-1027] - Fixed issues with SFX being played from sources not close to player. [AS-1345] - Fixed issue where Sandstorm audio would continue after the storm ended. [AS-1445] - The sound of oxygen being replenished no longer persists when disconnecting from the oxygen tether before the tank has fully recharged. [AS-1448] - Fixed issue where the ambient overworld wind sounds did not change when going deep underground. [AS-1370] - Fixed intermittent issue where the Rover did not make any sound when driven. [AS-599] - Fixed “double death” issue with Astroneer taking fall damage and dying again when respawning after falling from a high altitude. [AS-873] - Collecting multiple resources with the Drill will no longer cause all the open slots to break. [AS-1258] - Fixed issue where Save Slot 1 was sometimes overwritten when creating save data in Save Slot 2 and beyond. [AS-1297] - Fixed minor but extremely annoying issue where newly built base conduits would not follow the hologram path. [AS-1329] - Upon death, previous backpack inventory should no longer appear hovering next to the Habitat. [AS-1369] - Fixed issue where incomplete nuggets of Power were not consumed when placed on a slot. Some of these are grouped up, but included multiple issues. The main branch of the game should be much more stable, although we are sure there are still some lingering issues out there. Multiplayer crashes should be much less frequent, and performance should have improved across the board. NOTE: If you previously used INI tweaks to adjust Astroneer performance, we recommend you reinstall the game, or revert your config files. We upgraded Unreal, and old tweaks to the .ini file will most likely cause you to crash or encounter unintended behaviors. Many crash reports we receive are related to the adjustment of source files, and we cannot offer support for saves broken by these adjustments. On Xbox One, any changes made to the options menu will not persist between sessions. This will be fixed soon. Some “vocal” efforts play on the server when activated by the client. Sound for some players is defaulted to 0 on startup. Get into that new menu and turn it up! Modularity was another topic that got teased during vlog 012. This is the exact moment it flashes across the screen. Aaron showed the team a prototype that confirmed our feelings all along: building with modular pieces looks awesome. Now comes the hard part of making it fit in with the core gameplay loop, among many many other considerations. We will update with more details soon. Research 2.0 "minimum viable" prototype was tested internally. I can't share lots of details about this right now, but Research 2.0 is going really well. If you missed it, some eagle eyed Astroneers pulled an image from vlog 012 that shows off the current direction, WHICH IS VERY MUCH A WORK IN PROGRESS. This still has a long way to go, but a much more deliberate research system for progression feels really great and we cannot wait to get this into experimental for you all to try. Dedicated servers are now working outside of the editor. Another milestone in the long push to get dedicated servers operational. Andrew has been working on getting these spun up for us to try internally. While we still need to optimize and work out a TON of infrastructure tasks related to the current game as well as future features like online persistence, we are nonetheless one step closer to rolling out dedicated server support. Terrain 2.0 new spherical planet is in progress. Zabir is working on applying the Terrain 2.0 prototype to spherical planets. If you haven't heard, Terrain 2.0 will allow us to dramatically increase performance, which will allow the game to run better, but more importantly, lift the multiplayer player limit. We are still a way off from doing that, but it gives some context for the importance of Terrain 2.0. Ok this has been a long one! Thanks for reading, and as always please don't be afraid to reach out with feedback, bugs, and suggestions! Btw: we are 100 subscribers away from 20k on Youtube! If you haven't already, go over and subscribe so you can get weekly updates on what we are working on! Can we have a Donut planet ? nice one, keep up the good work guys. Yes, new update just came this fast, I'm also very excited for modularity. Awesome thanks . the max resolution is only 1920 X 1200 or am I doing something wrong ? I'm not interested in modularity at all. Without meaning to sound negative, I just don't see any benefit to it. I'm perfectly willing to be convinced otherwise but I shall not be holding my breath until it is a reality. Good sound design can make or break a game. Also, happy you guys have been working on multiplayer. Ty! I love the audio improvement also, and the way the oxigen is being delivered sounds very tacticle and technically correct now. The only thing I find a bit weird is that the resource sucking noise (if you pick up compound etc), doesn't slowly go higher in pitch as if there's something being filled, like it did before. 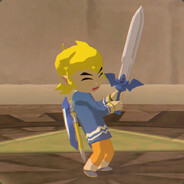 Fixed numerous Multiplayer crashes related to interacting with items in the world as a client. I don't know if I would call that first point fixed still happens for me. The game is even more unplayable than it was for me before this update I swear every update you put out, the crashes on Xbox one gets more and more frequent, I loved this game when I first started playing it now every time I play it I just get mad. I wish someone would have left a review for it on the xbox that just said (If you love playing games that crash every 10 minutes this is the game for you). I really wish the issues me and my friends are having would have been fixed months ago... please fix your ****. Sorry for the rage, I know you are all working hard on this game I just really enjoyed it when it didn't crash all the time. I have to agree with XEIRO!! I mean I hate to rain on your parade but what good does any of this update do if you can only play 10 minutes at a time? It's so annoying and then what makes it worse for me anyways is that this game has had the same problems since December! And I cant speak for everyone but I don't really care about the sound or the menu what good is better sound when there is still NOTHING to do? It was ok for s while but I've become very bored with this game the only thing to do in it is build a base until the game crashes over and over, start over build a base until it crashes over and over.. repeat,repeat, repeat! I've given up on this game ever being anything more than what it is now unplayable and boring.. oh well Red Dead Redemption 2 will be out soon.. now that's a game!!! I think you may be a bit too critical in your thoughts. You do realize the game is in PRE-Alpha right? They mentioned they fixed numerous crashes and bugs this update. You can't have a bunch of new game play content without first fixing the core game / foundation. Also, they released new content and prototypes on the experimental version just last week. Each person on the team has a different job. Don't expect the sound guy to start programming or designing new 3D models. Each person has their own specialty for what they work on. I recommend you take a break from the game and come back when new updates drop or when they get closer to getting out of PRE-aplha. From a game design perspective most new content happens in the beta phase, when all of the groundwork has been laid out and game play bugs fixed. I think its awesome they let us try out their prototypes and we can provide feedback to help shape the future of Astroneer! Sorry you are getting crashes, we went through a pretty extensive QA pass internally, with an external team as well. Can you give me any info about what you were doing at the time? Is this an old save? Is everyone on the new version of the game? Would love any info so we can try and reproduce in house. Thanks for the reply. We are all on the new version, It wouldn't even let us join together till we were. The first time it happened after the patch my buddy was unlocking research and I was in a cave and all I did was touch an uprooted plant to move it out of the patch I had made, crashed as soon as I bumped into it. I am afraid to even touch unidentified research atm my friends came down to help me move a trove I had stock piled from in a cave to the surface, sadly now when I pick up research it won't let me drop it and just hovers wherever it was at when I hit the trigger to release it then kicks me, after re-logging it will still be hovering in that spot but the game does not recognize it as anything and can't be picked up, this happens with every 5 to 10 I try and pick up and more so if I am not the host. Then the most common issue I am still having is I am unable to use rovers if I am the one driving, when I get out it drops me into the ground and then shoots the rover into the atmosphere, glitches me back to the surface then crashes upon rejoining the game said rover does the same thing as the research and will not fall back to the ground and the ones that are close enough to interact with the game does not register that there is anything in interaction distance at all. I have videos and screenshots as every time something happens I try and record it when I get the chance I will send those your way. Other times I have no idea why it crashes at all it crashes ALOT while just walking doing nothing at all. 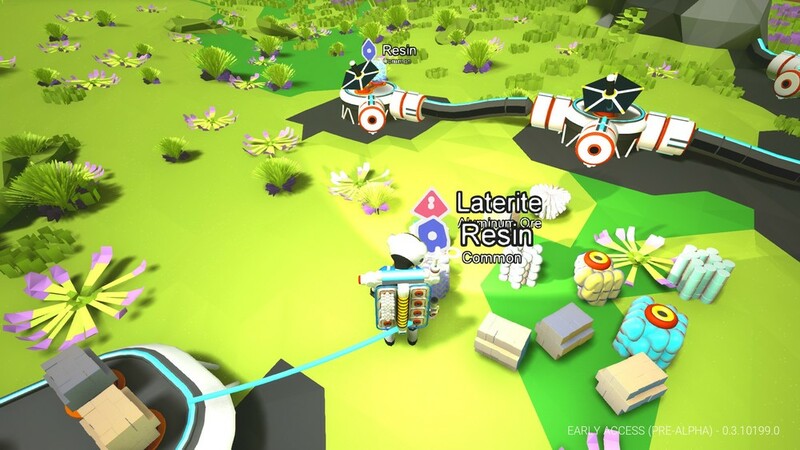 I only have issues with the Xbox one version of the game since it is a play anywhere game I do play on my computer from time to time and have no issues whatsoever, but the few people I play Astroneer with online don't have a computer and it won't let us join from play anywhere pc version to Xbox so I don't play it on the pc much. I would strictly play it on PC could I join or host a game with them. Sounds like a plan I should be able to get on in an hour/two if you are available later this evening or I am free all day tomorrow. Enjoying the feel of the rovers, was anything done to them? The suspension looks great! Reminds me a lot of the pre release trailers... can we please utilise space bar as a hand brake? Cause who doesn't want to rally around the planets? I encountered something of a bug/performance issue with this build of the game on XboxOne. This was discovered while attempting to turn music all the way down to see how the game felt without music. I tested it quite a bit afterward to discover that it seems that changing any of the settings, in any amount, wether it be 7 brightness, or 98 Ambient Effects Volume, or Invert Camera Y-Axis On, as soon as the click "APPLY AND RESUME" button, there is a massive drop in framerate. This can be worked around by exiting to the main menu, and loading the save game again, and I noticed my changed settings are still be applied, and the game runs perfectly fine like normal. I have no idea if this is an important factor or not, but I am what's called an Xbox Insider Member, Alpha Ring, which means I have an updated OS running on my console, which is far ahead of most people's OS, and is experimental. Where the connector points on resources all meant to go with this patch with just Energy & Oxygen keeping them ? MP crashes just like build 196,197, and now 199 3 builds same problem with MP. Seems like it happen mostly in the caves when the client tries to pick up research dug out under the smokers or other plants. New install new build verified files . 3690X processor 6 core 3.8 4.2 turbo. I can confirm the drop in frame rate. 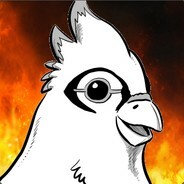 I am also in the Insider Alpha ring. Love the new sound effects! One thing I noticed is that the "puffy poison gas shooting plants" no longer make that sickening crunch sound when you detach them from the ground. Maybe because my range is too far away (but that is because I take them out at max range of the terrain tool). I kinda liked the audio feedback when I detached them in previous versions. Request the devs bring back the detach sound (in some form). Of course I could be mistaken as I've only had a chance to play 199 for a couple of hours. Has anyone else experienced this? I have had around 6 MP crashes in the last hour as client we switch I am host friend is client same thing he crashed to desk top. I sent in A few crash reports to joe@systemera.net; hope this help's to crush the bugs that have been around since Build 196.